One of the world's most prominent destinations in tourism, Antalya, has seen the number of foreign air passengers arriving in the city exceed 11 million since the beginning of the year, leaving behind 2014 figures – considered as the best year ever in tourism. Often called Turkey's tourism capital, Antalya is expected to hit an all-time high and host around 14 million foreign visitors this year. According to the Antalya Provincial Directorate of Culture and Tourism, more than 1.87 million foreign passengers arrived in the cities two airports, the Antalya Airport and Gazipaşa Airport, from Sept. 1-29. The figure corresponded to an increase of 25 percent compared to the same period last year. Turkey' tourism capital welcomed around 11 million visitors via the two airports - 10.71 million arrived at Antalya Aiport and 287,800 at Gazipaşa Airport from Jan. 1 to Sept. 29, according to the data. While there was a 28 percent increase compared to the same period last year, the increase compared to the same period of 2014 was 769,196 more tourists. Antalya hosted 2.41 million more foreign tourists compared to the same period last year. 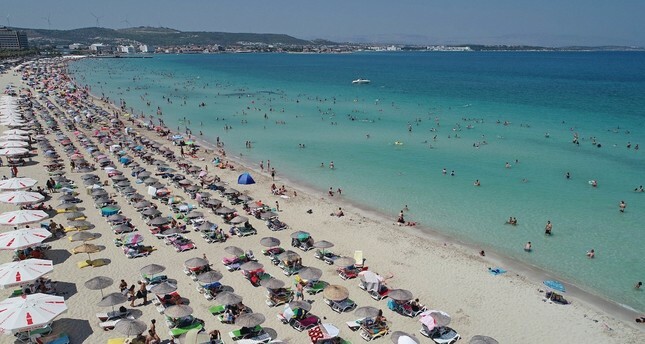 Meanwhile, Turkey overall hosted some 27 million foreign visitors from January to August this year, the Ministry of Culture and Tourism announced on Friday. According to official figures, 32.4 million foreigners visited Turkey last year, while the number of arriving foreigners was 25.3 million in 2016. The Turkish government set a target of 40 million tourists and $32 billion in tourism revenue for 2018. While the country hosted 36.8 million foreigners in 2014 and 36.3 million in 2015, the figure decreased sharply to 25.3 million in 2016 but rose again to 32.4 million last year, according to the Turkish Statistical Institute (TurkStat). Turkey is targeting 50 million tourists and $50 billion in income by 2023, according to private sector representatives and officials.